5.56 NATO punch in a lightweight, 3.4-pound package. The PLR-16 has a conventional gas-piston system and utilizes the proven Johnson/Stoner breech locking method. For adding tactical accessories, it features a integrated Picatinny rail and the muzzle is threaded to accept a muzzle brake or flash hider. Plus, it comes equipped with adjustable sights to put you on target fast and with maximum accuracy. Kel-Tec PLR-16 Pistol, Semi-automatic, 5.56 NATO, 9.2 Barrel, 10+1 Rounds is rated 5.0 out of 5 by 6. Rated 5 out of 5 by RobWI from Great price on a unique pistol. Flawless out-of-the-box. No FTF, or FTE encountered in the first 240 rds so far. An absolute blast to shoot. Everybody wanted to try this one at the range when it arrived, lol! Great service from my local FFL- D&L Gunsmithing of Peshtigo, too. 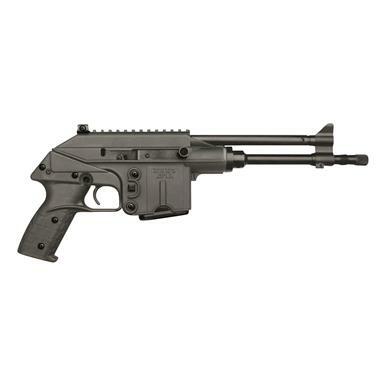 Rated 5 out of 5 by Dave FI from Best of Type Kel-Tec; USA made, well designed and built, priced right. In a word, SWEET! Rated 5 out of 5 by Ken Roll from Great Price, fast & easy delivery to my local FFL. Very hassle free transaction I haven't shot it a lot yet, but the shots I did,...WOW is this thing fun to shoot. I now have all the accessories on it & need to spend an afternoon at the range to dial it in.I liked it so much my brother wanted one too. Sad to say they were sold out already by then. Rated 5 out of 5 by Artful Dodger from Awesome Quality American build. Awesome product. Ran over two hundred rounds through it the first time out. Never a failure to feed. Ordering from Sportsman's guide is completely hassle free. The FFL I ship to, Unicorns Armory, is an excellent resource.Would not hesitate to recommend the PLR-16 or ordering through Sportsman's Guide. Rated 5 out of 5 by Dave from Fun Shooter This is a fun gun to shoot, and throws one heck of a fire ball! The combat shotgun of the U.S. Marine Corps. AK-style pistol loaded with features.